Subscription Forms - Authentic Documentation - Code Supply Co. 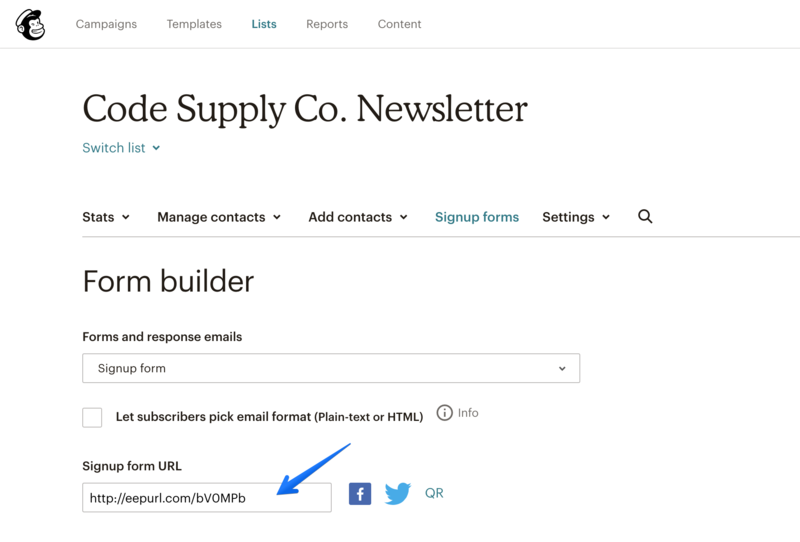 Easily add opt-in (subscription) forms to your website and grow your subscribers’ list with the Opt-In Forms module. Currently the Opt-In Form module supports MailChimp as the only provider. We’ll be adding other service providers if more users request it. Navigate to Settings → Opt-In Forms. Select a list from the Default List select field. Optionally enable Double Opt-In and a Data Privacy Checkbox. Drag the Subscription Form widget to the desired widget area. Subscribe Message. Default is empty. Background Image ID. Default is empty. If set to true, will add the First Name field to the form. Default is false. MailChimp list id. Default is default. You may also insert a link to your signup form in menu or a button. In order to find the Signup Form URL please navigate to the MailChimp dashboard, then go to your list → Signup Forms → Form Builder → Signup Form URL.